#1 A New Economic Paradigm? 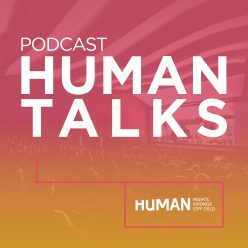 A podcast dedicated to shed light on current human rights issues. Recorded during HUMAN International Documentary Film Festival. HUMAN IDFF is an annual documentary film festival in Oslo. The festival present a full-day program with new documentaries from all parts of the world, together with debates, concerts, seminars, workshops and performances. Since the 1930’s global political economy has moved, broadly speaking, from a Keynesian understanding to a neo-liberal one. Through IMF conditionality, countries have implemented liberalist reforms. Such reforms have in some instances led to growth in inequality, lower job security, reduced minimum wage and cut in state pensions. Do these policies create positive development or should the welfare of the population in a country in economic crisis take centre stage? Do we need a new economic paradigm? Panel: Jeffrey Franks, IMF European director. Maria Berg Reinertsen, economist and journalist for Morgenbladet. Erik Reinert, Economist, Author and Professor of Technology Governance and Development Strategies at Tallinn University of Technology. Camilla Houeland, developmental scientist, Norwegian University of Life Sciences. In cooperation with SLUG – Debt Justice Network Norway. Neste Neste innlegg: #2 Bevaring av regnskogen, naivt?